June 10, 2015, 12:21 p.m.
By Joseph Lichterman @ylichterman June 10, 2015, 12:21 p.m. There are early indications that the digital listenership habits of the public radio audience are changing, as fewer people listen to live streaming audio and a growing number choose to tune in on demand. Total live streaming hours fell 6 percent in the first quarter of 2015 from the year prior, according to data from NPR Digital Services, which monitored 239 different public radio streams. Meanwhile, on-demand listening — which for NPR includes podcasts and individual segments that were initially broadcast on air — seems to be growing by a few different metrics, NPR said. “This reflects the larger consumer trend that we see across all media, which is live consumption of any media, including television, shifting to on-demand, self-curated experiences,” Steve Mulder, NPR’s senior director of audience insights, told me in an interview at the NPR Digital Services office in Boston. On-demand listening now accounts for one-third of all digital listening hours for station content, NPR said. On average, users download 40 minutes of audio each month, according to an NPR study of 161 member stations. 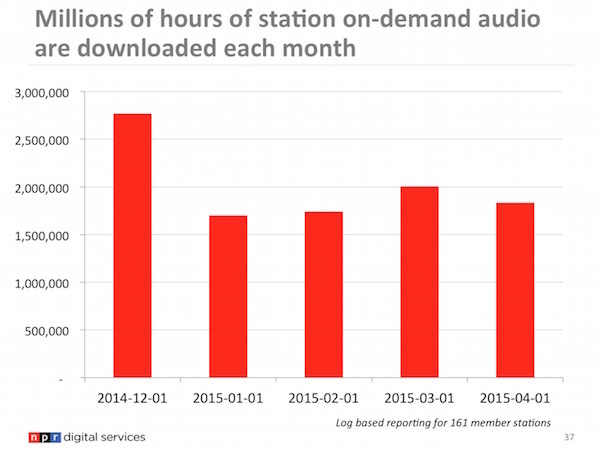 In April, nearly 2 million hours of on-demand audio were downloaded from local stations. Last summer, NPR launched another avenue for on-demand listening: NPR One, the app that lets users customize a mix of national and local stories. 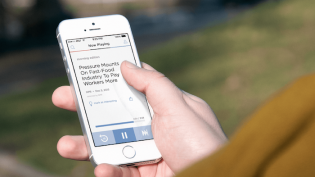 NPR has previously not disclosed listenership figures for the app, but in a presentation to member stations last month, NPR Digital Services said there were just over 150,000 NPR One users in April. 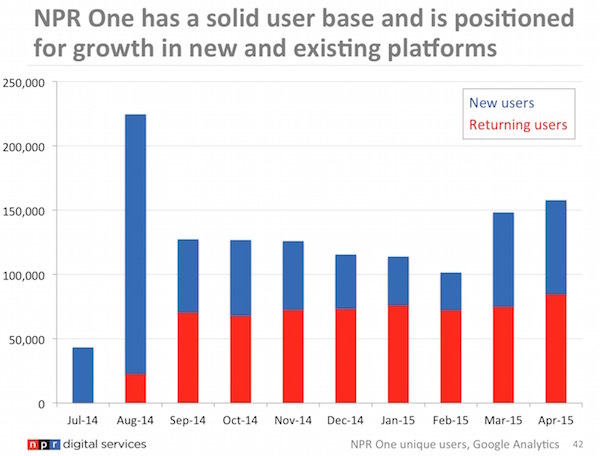 Since last fall, NPR One has had a base of about 75,000 returning users each month. Users have also been spending more time with NPR One since it launched. 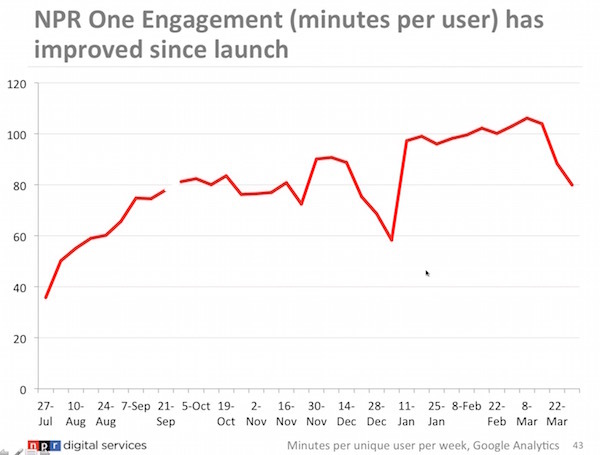 As of April, users were spending about 80 minutes per week with the app. Despite its growth, the NPR One audience, remains a fraction of the size of most of the other NPR digital listening options. 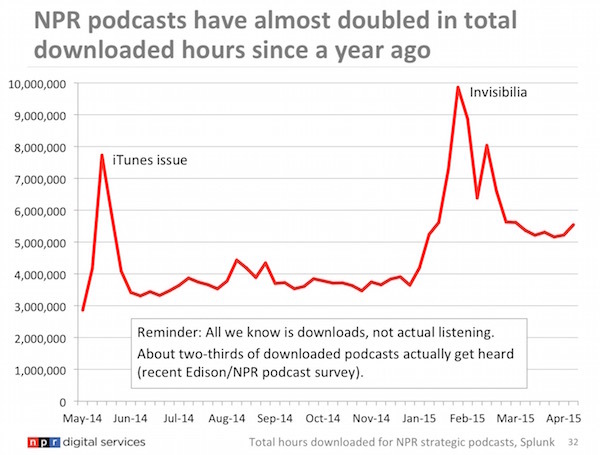 Beyond NPR’s own app, usage statistics for the third-party apps where public radio content is available similarly seem to show a shift toward on-demand listening. 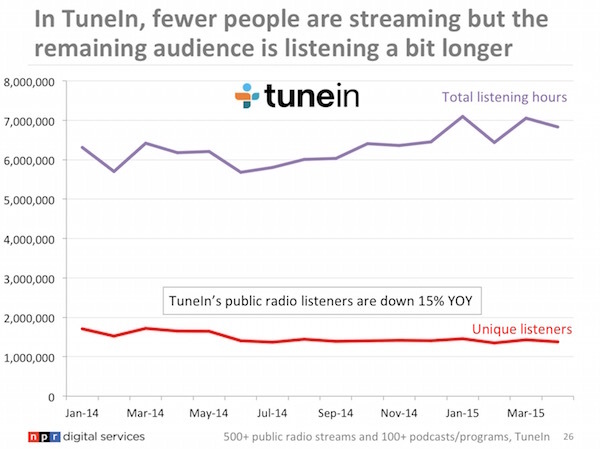 The public radio listenership in TuneIn, which is predominantly a streaming app, was down 15 percent year over year in April, NPR said. 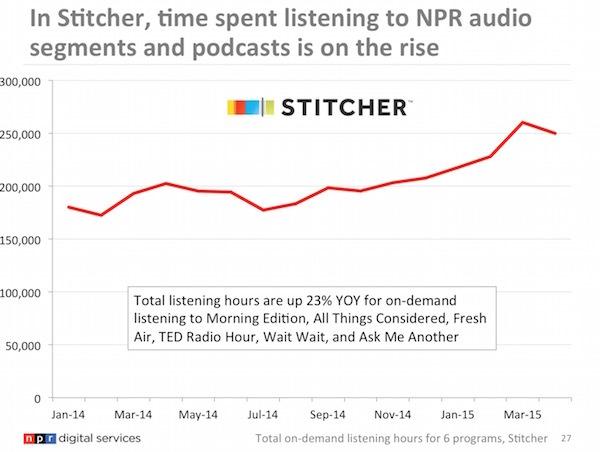 On Stitcher, however, total listening hours were up 23 percent for the six NPR programs that are available for on-demand listening. “It was another clue for us that what we’re seeing is not just restricted to NPR’s own podcasts on our own platforms, but it’s happening everywhere to public radio at large,” Mulder said. Despite these indications of a shift, Mulder cautioned that it’s too early to determine how much of a long-term trend this is for public radio listenership. 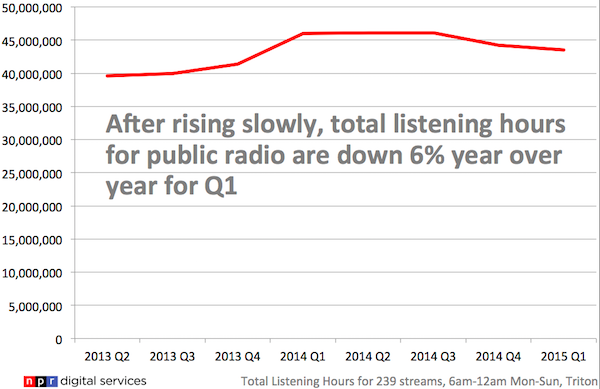 Though NPR Digital Services has been measuring streaming data across the public radio system since 2012, it only began tracking on-demand listening of member stations in November 2014. NPR uses stations’ log files to determine how much content is being downloaded and how much time is spent listening to it. As a result, it’s impossible for NPR to differentiate between the different types of on-demand content that’s being listened to — podcasts and segments that were originally broadcast on air both show up as MP3 files in the log. Though podcasts entered the zeitgeist last year with the runaway success of Serial, Michelle Bellettiere, NPR senior manager of digital analytics, said podcasts at member stations have likely been seeing slow solid growth for a longer period, though they haven’t been really able to track it until this point. NPR expects more of its listenership to move to its on-demand offerings, and as that shift continues, the network and its member stations recognize that they’ll need to rethink how it approaches membership — the lifeblood of the system. This year, Digital Services is launching a study that examines what drives donations and loyalty to stations. Mulder and Bellettiere said that NPR’s current analytics software only allows them to see 90 days’ worth of data, but for this study they’ll use Google’s BigQuery tool to get a longer-term picture of user information to attempt to understand what brings people back over time and influences their decision to donate. This is important because station members often pay annual memberships, or monthly sustaining memberships, and with the shorter period of existing analytics data it can be difficult to ascertain what behaviors relate to membership, Bellettiere said. There’s also the potential for this type of information to to be integrated with data from stations’ customer relationship management software or other offline databases that would allow stations to get a better picture of who their members — and potential future members — are and what attracts them to public media. Photo of NPR newsroom by Ted Eytan used under a Creative Commons license. POSTED June 10, 2015, 12:21 p.m.
Lichterman, Joseph. "Public radio is seeing a shift in digital listening: Live streaming is slowing, on-demand is growing." Nieman Journalism Lab. Nieman Foundation for Journalism at Harvard, 10 Jun. 2015. Web. 23 Apr. 2019. Lichterman, Joseph. "Public radio is seeing a shift in digital listening: Live streaming is slowing, on-demand is growing." Nieman Journalism Lab. Last modified June 10, 2015. 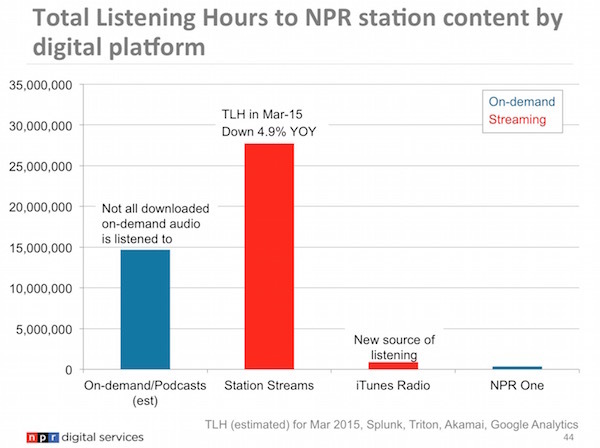 Accessed April 23, 2019. https://www.niemanlab.org/2015/06/public-radio-is-seeing-a-shift-in-digital-listening-live-streaming-is-slowing-on-demand-is-growing/.